Proximal 4-5 suckers small, barrel shaped, closely packed. Suckers 5 to 20-25 with more conical shape; suckers 5-13 closely packed; suckers 14 to 20-24 broadly spaced, up to 15 mm apart (intersucker distance about twice sucker diameter). 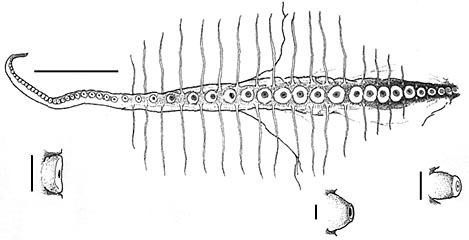 Suckers 6-12 with largest diameters (up to 9 mm or 13% of head width in males and 4.8 mm or 12% of head width in females). See chart below. Distal suckers (beyond suckers 19-24) in both sexes closely packed, cyclindical in shape and decline rapidly in size. Figure. Oral view of Arm I of S. gilchristi, male, and side view of selected suckers. Suckers from arm I - (left to right) Distal sucker, mid-arm conical sucker, proximal sucker. Drawing from Collins and Henriques, 2000. Horizontal scale bar = 100 mm; vertical scale bars = 2 mm. Drawing from Collins and Henriques, 2000. Figure. The maximum sucker diameter relative to the size of the octopod. Head width is used as the size standard since mantle length is highly variable due to fixation and preservation. 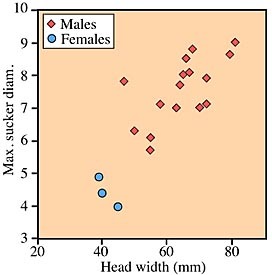 Sexual dimorphism in sucker size between males and females cannot be determined from the chart due to the lack of large females. Compare this with the similar chart for S. syrtensis. Note however, that the sucker sizes tend to be much larger in S. gilchristi. Drawing modified from Collins and Henriques, 2000. This description is taken from Collins and Henriques (2000). More details of the description of S. gilchristi can be found here. This species is most easily separated from S. syrtensis by the smaller sucker size in the latter (S. syrtensis females up to 2.2 mm in maximum sucker diameter and males up to 6 mm in maximum sucker diameter compared to 5 mm for females and 9 mm for males in S. gilchristi), and the more distal position of the largest suckers in females (suckers 9-14 in S. gilchristi vs 1-3 in S. syrtensis). The latter feature is associated with sexual dimorphism in sucker size in S. syrtensis and suggests that S. gilchristi lacks sexual dimorphism. A nearly mature female had 746 oocytes in the ovary of which 31 were larger than 3 mm and 5 larger than 7 mm. Maximum oocyte size was 9.5 mm. 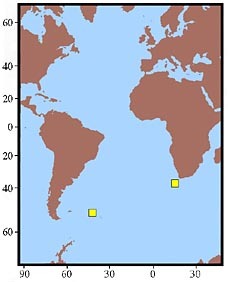 Distribution records given here are for octopods examined by Collins and Henriques, 2000. Most specimens examined were from the western South Atlantic (off South Georgia). The holotype from off South Africa has the cirri beginning prior to sucker 2 rather than 3. As a result, Collins and Henriques (2000) suggest the possibility that better material could indicate that the octopods from opposides of the South Atlantic are different species. Presently this species is known only from these two localities. Figure. Geographical distribution of S. gilchristi. Chart modified from Collins and Henriques, 2000.